Time flies when you have kids, and I can’t believe London and Maddie are finishing up their third year of 4-H Prep with the grand finale — the Somerset County 4-H Fair in Bridgewater, New Jersey. London is graduating from Prep this year in a little ceremony tomorrow night — Thursday, August 12th. This year, we’ll spend some of our time at the 4-H Fair helping London to learn about all of the choices she has for a “regular” (4th through 12th grade) 4-H club in the Fall. Since we got our cockapoo puppy, Peanut Butter, the girls have been interested in a dog obedience club, but that may have to wait until next year when we get a second cockapoo (Honey) and Maddie is also old enough to join. I have been going to the Somerset County 4-H Fair for almost 40 years, since before I was even old enough to be a 4-H Prep Club member. Despite the fact that we live in Morris County, as soon as London was old enough to join last September, I started taking her over to the Prep Club meetings at the Ted Blum 4-H Center in Bridgewater, NJ (Somerset County, about five minutes from the house I grew up in). After London’s second year and Maddie’s first official year in the Crazy Clovers Prep Club (Maddie participated as a “tag-along” when she was too young to join), our family continues to believe that Somerset County 4-H is the best 4-H experience in the surrounding area. The Somerset County 4-H Fair, rather than going commercial with rides and games, focuses on the kids and their achievements. Our whole family loves to see the dogs, cows, sheep, rabbits, goats, horses and alpaca. This past year, London and Maddie met the kids (and their pets) from the reptile club during one of their Crazy Clovers prep meetings, and the girls are hoping to get an anole and a leopard gecko in the Fall, so I bet we’ll be spending some time with the lizards at the 4-H Fair this summer. In the chicken tent, there’s always an incubator full of eggs with chicks being hatched before your eyes. Even though we haven’t yet found the right family pet (and 4-H focus when London graduates out of the Crazy Clovers Prep Club next year), Rex remains enthusiastic about the prospect of owning chickens, so we’ll be spending some quality time in the chicken tent with the Wattles and Snood club to learn more about the process of raising chickens. This year’s Somerset County 4-H Fair promises to be bigger and better than ever, attracting tens of thousands of visitors with its wholesome mix of arts, entertainment, agriculture, animals, science, food, fellowship and just plain fun. 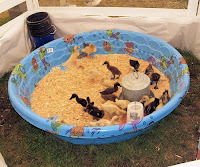 The 2010 Somerset County, NJ 4-H Fair runs Wednesday, August 11th through Friday, August 13th. 10am-10pm all days. The weather promises to be perfect, and we’ll hope to see you out there. Tomorrow evening (Thursday, August 12th), you can look for London, Maddie, Rex and me in the 4-H Prep Club Cotton Candy Tent! One family led the kids in a game based on “Picnic,” with each member choosing an animal (with same starting letter as their name), then expanding on this to discuss the natural habitat of the animals selected, using hand-out maps of the continents. We made crafts, including one night when the kids created special pins for Mother’s Day by coloring Shrinky Dinks and shrinking them down in a toaster oven. This year, at one of our club’s October meetings, I’m hoping to re-enact a favorite activity from my 4-H Prep Club, the Branchburg Beavers. It’s been about 35 years, but I still remember the meeting when our whole club carved pumpkins together.
. 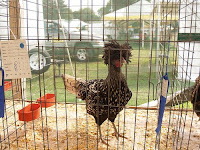 Since his first visit to the 4-H Fair in 2002, Rex has been enthusiastic about the prospect of owning chickens, so in addition to our 4-H Prep Club meetings, we’re going to try to sit in on some of the Wattles and Snood club meetings this year to learn more about the process of raising chickens. In 4-H, you can learn about science, go-karts, animals, rocketry, clothing, creative arts, food & nutrition, while developing leadership skills and public speaking and much more. Best yet, you can have FUN and meet new friends too! I have been going to the Somerset County 4-H Fair for over 35 years, since before I was even old enough to be a 4-H Prep Club member. Despite the fact that we live in Morris County, as soon as London was old enough to join last September, I started taking her over to the Prep Club meetings at the Ted Blum 4-H Center in Bridgewater, NJ (Somerset County, about five minutes from the house I grew up in). After London’s second year and Maddie’s first official year in the Crazy Clovers Prep Club (Maddie participated as a “tag-along” when she was too young to join), our family continues to believe that Somerset County 4-H is the best 4-H experience in the surrounding area. The 2009 Somerset County, NJ 4-H Fair runs Wednesday, August 12th through Friday, August 14th. 10am-10pm all days. Right now it is pouring down rain at home in the Roxiticus Valley, but we’ll hope the weather will turn around and we’ll see you out there. Later this afternoon/early evening (Thursday, August 13th), you can look for London, Maddie and me in the 4-H Prep Club Cotton Candy Tent! Bridgewater Township: Saturday, July 4, 2009. Washington Campground Association’s annual one-hour Fourth of July ceremony will take place at 10:00am at the Middlebrook Encampment Site at Mountain Avenue and Middlebrook Road. It will include a retiring of the colors by an honor guard, followed by the reading of the Declaration of Independence by Sallie de Barcza, a direct descendant of John Hancock. 5:00pm North Branch Park on Milltown Road. Family festival with live musical entertainment. Activities include a moonwalk, giant slide and cartoon characters for children, Revolutionary War-period groups and other attractions. Live music will be performed by Bounce Ooolala and Daniel, Shorty Long and the Jersey Horns and Fortune. Fireworks at 9:30 p.m. For all the details, check online (somersetcountyparks.org) or call (908) 722-1200, ext. 225. Chatham: Chatham Borough’s annual Fourth of July parade begins at 10 a.m. on Saturday on Hillside Avenue and continues down Main Street to Chatham Middle School, 480 Main Street. A picnic on the school grounds begins after the parade, with hot dogs and other refreshments. Fireworks are scheduled at dusk. For more information, please call (973) 635-9090. Chester: The West Morris Community Band presents an Independence Day weekend concert at Chubb Park (off Routes 24 and 206) on Friday, July 3rd at 7:00 p.m. For details please call (908) 879-5100. On Saturday, July 4th, an Independence Day celebration will take place from 1:00pm to 3:00pm at Cooper Mill on Route 513. Visitors are encouraged to bring a picnic lunch and blanket or folding chair. Admission is $3, $2 for seniors and $1 for ages 4-16. Call (908) 879-5463. Denville: A Fourth of July band concert will kick off activities at Gardner Field, just off Route 46 West at Savage Road from 7:30 to 9:30 p.m. Saturday, followed by fireworks. Call (908) 964-0026. Dover: Holiday activities begin with food, refreshments and musical entertainment by Tropical Storm at 6 p.m. on Friday, July 3rd on Hamilton Field, 302 E. McFarlan Street at Route 46. Fireworks start at 9:45 p.m. For more information, please call (973) 366-2200. East Hanover: Festivities begin at 4 p.m. on Saturday, July 4th, in Lurker Park on Eagle Rock Avenue including children’s rides, pony rides, food, refreshments, DJ music and games. At 8:00pm, Jimmy Sturr and his Orchestra will perform, followed by fireworks at dusk. Call (973) 428-3091 for details. Flemington: The Flemington-Raritan Recreation Committee will sponsor fireworks at the Reading-Fleming Intermediate School on Allen Street at dusk Friday. Call (908) 284-7501. Florham Park: Independence Day events begin with a flag-raising ceremony at Firehouse No. 1 on Brooklake Road at 9 a.m. Saturday, July 4th. A parade steps off at 9:30 a.m., rain or shine, at Ridgedale Avenue and Brooklake Road. A family picnic will be held on the borough hall lawn at Ridgedale Avenue and Elm Street from 10:30 a.m. to 3 p.m., with children’s rides, games, pony rides, a petting zoo and the Saint Barnabas “Fire Safety House.” Fireworks are scheduled for about 9 p.m. Look online (www.fpjuly4th.com/schedule.html) for more details. Franklin Township (Somerset County): Food vendors, inflatable children’s amusements, crafts, games and a clothesline arts exhibition will take place at the municipal complex, 475 DeMott Lane in Somerset, from 6 to 9 p.m. Thursday, followed by fireworks at 9:15 p.m. Parking will be available at the Sampson G. Smith School. Call (732) 873-2500. Glen Gardner: There will be firetruck rides for children Saturday in celebration of Independence Day. The first truck will depart Glen Gardner Borough Park at School Street and Hampton Road at 10 a.m. and rides continue until noon. Call (908) 537-2370. High Bridge: In addition to hosting its sixth annual traditional Fourth of July celebration Saturday at the Solitude House Museum, 7 River Road, High Bridge will commemorate the 100th anniversary of the Lake Solitude Falls. There will be free food, including hot dogs, soda, ice cream, popcorn and snow-cones, and entertainment by Billy D. Hunter. The High Bridge Mini-Historians will read their compositions from this year’s competition. Call (908) 638-3200. Lebanon: The 62nd annual Lebanon Borough Fourth of July parade will kick off 10 a.m. Saturday with a theme of “Many Faces, One Nation.” It will run from Main Street to Myrtle Avenue, then down Brunswick Avenue, Beforehand, there will be a baby parade at 9:30 a.m. on Sutton Place, and a “Borough Students of the Month” presentation at 9:50 a.m. in Holjes-Sheppard Park, 6 Maple St. behind Lebanon Borough Elementary School. Call (908) 236-8464. Lincoln Park: Paired with the grand opening of the Jerry and Dolores Turco Medical Rehab Center, the Lincoln Park Care Center at 499 Pine Brook Road will host a variety of activities 6 p.m. Saturday, including carnival games, pie-eating contests, a moonwalk, an “Elmo & Friends Revue,” an obstacle course, face-painting, watermelon-eating and hula hoop contests, rock climbing, balloon-making and a DJ. Foods will be available, and fireworks are scheduled to begin at 9:30 p.m. Call (973) 696-3300. Mendham Township: Saturday, July 4, 2009, 9:00am. “Dancing in the Street” parade down Main Street in Brookside. Morristown: A Fourth of July celebration is scheduled to begin noon on Saturday, July 4th, at Washington’s Headquarters Museum in Morristown National Historical Park, 30 Washington Place. Stories, riddles, jokes and an inspection of the troops will precede a reading of the Declaration of Independence at 1p.m. Costumed park rangers will denounce tyranny and praise liberty, and the festivities will conclude with celebratory musket volleys. Call (908) 879-5463. Fosterfields Living Historical Farm, 73 Kahdena Road, will host a patriotic celebration from 1 to 3 p.m. on Sunday, July 5th, with old-time games. Visitors are encouraged to bring their own lunch. Admission is $6; $5 for seniors; $4 for ages 4-16; $2 for ages 2-3. Call (973) 326-7645. Mount Arlington: A fireworks display over Lake Hopatcong will begin at dusk Thursday, sponsored by the Lake Hopatcong Yacht Club, 75 Bertrand Road. Call (973) 398-4324. North Plainfield: The 4th of July Parade begins at 10:00am on Saturday at Wilson Avenue and Greenbrook Road and ends at the North Plainfield Community Center on Clinton Avenue. The honorary grand marshal is the North Plainfield Volunteer Rescue Squad, celebrating 60 years of service. Call (908) 769-2902 for detais. On Sunday, July 5th, there will be a concert by Mylan starting at 7:30 p.m. at West End School, with fireworks to follow at dusk. Call (908) 769-2900 for more informations. Parsippany: The annual Parsippany fireworks display will take place at dusk Saturday at Parsippany Hills High School, 309 Baldwin Road. Call (973) 263-7001. Randolph: Randolph’s annual Independence Day parade will be held at noon on Friday, July 3rd, beginning at Dover Chester Road and Randolph Avenue and marching to the County College of Morris. It will be followed by a Freedom Festival Fair from 2 to 11 p.m. at the college. The fair will continue on Saturday, from 2 to 11 p.m., with fireworks set to begin at 9:45 p.m. Call (973) 442-7608. Nash Dancenter at 10-12 Emery Ave. will host a Fourth of July party with a picnic-themed ballroom and Latin dance social 4 to 8 p.m. Sunday. Participants are invited to dress in casual red, white and blue clothing. Admission is $20. Call (973) 328-7979. Somerville: Somerville, where Roxy went to high school way back when, marks the 100th anniversary of its historic courthouse from noon to 4 p.m. on Friday, July 3rd with music, children’s games and entertainment, all part of an event called Picnic on the Green. The courthouse is at 20 N. Bridge St. Call (908) 231-7110 for details. If any of you Roxiticus Desperate Housewives out there attend these events, we hope you’ll come back here and share a comment with the rest of us. Have a happy and safe Fourth of July! Here at Roxy’s Best Of…, we’re running a contest and ticket giveaway to celebrate the Sugarloaf Crafts Festival coming to the Garden State Exhibit Center in Somerset, NJ this weekend — Friday, October 31st (Halloween) through Sunday, November 2nd. Since Roxy can’t make it to the event, the first Roxy’s Best Of… visitor to contact me using the contact form or leave a comment on this post with your e-mail address will win two tickets to the Sugarloaf Crafts Festival, with only one requirement: we’d like you to write a brief post for Roxy’s Best Of… letting our readers know all about your experience at the event. If you’re not from New Jersey but would like to attend and write about an upcoming Sugarloaf Crafts Festival at a venue near you, please contact Roxy and we’ll see what we can do for you. More than 300 of the nation’s finest artisans will present their unique crafts in a lively marketplace filled with entertaining demonstrations, food, music and family performances during the Sugarloaf Crafts Festival. Celebrating its 14th year in Somerset, the Sugarloaf Crafts Festival offers collectors and craft enthusiasts one-of-a-kind creations in functional and decorative pottery, sculpture, glass, jewelry, fashion, home décor, furniture and home accessories, items for the garden, and photography. The artisans at the Sugarloaf Crafts Festival are jury-selected based on the superior quality and craftsmanship of their work. “Sugarloaf Craft Festivals offer people – from serious collectors to the regular homeowner – the opportunity to purchase unique and personal fine art at an affordable price, and a chance to get to know the artist who made it,” said Sugarloaf President Deann Verdier. Lovers of fine crafts and art can do more than purchase items from the artists and learn more about the unique qualities of their works. The Sugarloaf Crafts Festival in Somerset also features entertaining and informative live demonstrations from master craftspeople working in metal, stone, glass, wood and ceramics presented each day during the Festival. Specialty gourmet food will also be available for sampling and purchase along with a variety of concessions. The Festival experience is enhanced by piano standards and renditions of pop favorites from Bob Geresti. In a special children’s area, kids will enjoy enchanting puppet shows from Middle Earth Studios. The Sugarloaf Crafts Festival will be held Friday, October 31 and Saturday, September November 1 from 10:00 a.m. to 6:00 p.m.; Sunday, November 2 from 10:00 a.m. to 5:00 p.m. at the Garden State Exhibit Center. The Garden State Exhibit Center is located at 50 Atrium Drive in Somerset, NJ. Adult admission to the Sugarloaf Crafts Festival is $7 when purchased online, $8 for adults at the door, free for children under 12. Admission is good for all three days, and free parking is available. For more information about the Sugarloaf Crafts Festival, directions, or to purchase discount admission tickets visit www.sugarloafcrafts.com or call (800) 210-9900. This just in from Roxy’s e-mailbag…the Sugarloaf Crafts Festival is coming to the Garden State Exhibit Center in Somerset this weekend. Starting Friday, October 31 (Halloween) from 10am to 6pm and running through Sunday, November 2nd, 2008 at 5pm, the Sugarloaf Crafts Festival promises to be a great place to spend a day with the family and get a head start on holiday shopping. In addition to more than 300 artisans, there will be live music, kid’s entertainment, and great food. Popular artists featured at the show include Danny Kong and Justin Wilner (designer tapestry handbags), Gerry and Donna Keener (fine quality art glass hand cut and fused), Peggy Wilson and Ignacio Bernal (handcrafted fine gold jewelry), Rona Fisher (primal elegance in precious metals), and Robin Barr (wearable sculpture). Middle Earth Studios will provide children’s entertainment with several performances each day from their repertoire of enchanting fairytales and puppet shows. Way back in the time before Rex (and until Rex and I consolidated our New York City and Somerset locations into one lovely home in the Roxiticus Valley), I lived over in Somerset, New Jersey…it’s near Rutgers and New Brunswick. If I weren’t so busy this weekend, I’d take Rex and the kids over to the Garden State Exhibit Center for “old times sake.” If you get a chance to attend the Sugarloaf Crafts Festival, please do stop back and let us know all about it. Adult admission is $8 at the door or $7 if you buy your ticket online or click here for a coupon for $1.00 off admission. Kids under 12 and parking are free. If you’re not from around here, check out the Sugarloaf Crafts Festival web site for an upcoming event near you…in Connecticut, Delaware, Georgia, Maryland, Michigan, Pennsylvania or Virginia. I know, I know… I promised you photos from the Somerset County 4-H Fair back in August… but the road to hell is paved with good intentions. I’m going to make good on my promise right now, as a way of encouraging those of you with kids in first grade through high school to come out with your family to the “Join 4-H” Open House on Tuesday, October 7th from 7:00 to 8:30pm at the Ted Blum 4-H Center in Bridgewater, New Jersey. Kids in Grades 1-3 (like London and Maddie) can join 4-H Prep. Kids in Grades 4-12 can join a standard 4-H club. Lots of Somerset County 4-H clubs will be represented with booths at this event…from 4-H Prep Clubs like the Crazy Clovers to specialty clubs, including: dogs, chickens, horses, cows/steer, rabbits, reptiles, scientists, chefs and more. Last year was London’s first year as a 4-H Prepper, and this year Maddie is old enough to graduate from “tag along” to a proud Prep Club member. This year, London and Maddie will be disappointed to miss our club’s first meeting, when our leader will be taking the kids on a bug hunt outside the 4-H Center. It’s been about 35 years, but at one of our club’s October meetings, I’m hoping to re-enact a favorite activity from my 4-H Prep Club, the Branchburg Beavers. I still remember the meeting when our whole club carved pumpkins together. I have been going to the Somerset County 4-H Fair for over 35 years, since before I was even old enough to be a 4-H Prep Club member. Despite the fact that we live in Morris County, as soon as London was old enough to join last September, I started taking her over to the Prep Club meetings at the Ted Blum 4-H Center in Bridgewater, NJ (Somerset County, about five minutes from the house I grew up in). After London’s first year in the Crazy Clovers Prep Club, with Maddie participating as a “tag-along” and planning to join the club in September, our family continues to believe that Somerset County 4-H is the best 4-H experience in the surrounding area. The Somerset County 4-H Fair, rather than going commercial with rides and games, focuses on the kids and their achievements. Our whole family loves to see the dogs, cows, sheep, rabbits, goats, horses and alpaca. In the chicken tent, there’s always an incubator full of eggs with chicks being hatched before your eyes. This year, I’ll commit to bringing my new Canon EOS Rebel XSi and sharing lots of animal photos here. The 2008 Somerset County, NJ 4-H Fair runs Wednesday, August 13th through Friday, August 15th. 10am-10pm all days. Don’t worry, we’ll be reminding you here at Roxiticus Desperate Housewives a few more times over the next four weeks. And late in the afternoon of Wednesday, August 13th, you can look for London, Maddie and me in the 4-H Prep Club Cotton Candy Tent! Sunday, October 5th from 12:30pm-3:30pm. In advance of the rummage sale, the VNA have the tents set up to accept donations, Monday-Saturday 10am-1pm, from September 6 - 24. The famous VNA Rummage Sale, held every fall and spring at the Fairgrounds in Far Hills, New Jersey, is New Jersey’s largest and oldest. As a major fundraiser for the VNA, one of the Roxiticus Desperate Housewives’ favorite charities, 100% of the proceeds support the VNA’s programs and enable the VNA to care for those who are uninsured or underinsured. If you haven’t been before, prepare yourself! Bargains are everywhere, and the selection, spread out over 75,000 square feet, is incredible: clothing, appliances, antiques, sporting goods, furniture, dishes, books…you name it and you’ll find it there. PAYMENT FOR MERCHANDISE: Shoppers can pay for goods with cash or checks (proper identification needed). An ATM is available on site. Credit cards are not accepted. Admission and parking is free. For more information, the Rummage phone line is (908) 781-6445. Fall Donation Dates begin on Saturday, September 6th, and run through Wednesday, September 24th at 1:00pm. Donation hours are Monday - Saturday, 10:00 AM - 1:00 PM. Warning: when they say the cutoff is Wednesday, September 24th at 1:00pm, they mean it. One Spring, Rex and I got stuck in traffic and showed up with a Jeep full of computer equipment and clothing at 1:02pm. The madman at the gate turned us away, and we had to wait until the Fall Rummage Sale to make our contribution. As you box your household items or bag your clothing, please sort like items together. Keep in mind that if the VNA cannot sell an item at the end of the sale, they will have to use Rummage Sale proceeds to pay for disposal, so please only donate saleable items. Please limit the weight of each box or bag of donations to less than 20 lb. for easy handling by volunteers. CLOTHING, SHOES, & CLOTHING ACCESSORIES: The VNA accepts clean items in good to excellent condition. The VNA cannot accept clothes with stains, tears, worn elastic bands, broken zippers or are missing buttons, shoes without buckles or laces, and belts that are tattered and worn. ELECTRICAL: The VNA Rummage Sale accepts clean electrical items in working condition. Vacuum cleaners must have all parts and model must be less than 10 years old. Please box or bag all parts together and attach to the electrical item. FURNITURE: The VNA will accept furniture in good to excellent condition. Luggage must be in excellent condition. No locked luggage without keys or combination. Car seats for infants and children must be manufactured within five years, a SAFETY CODE requirement. HOUSEHOLD/KITCHEN: The VNA accepts clean, saleable items in good to excellent condition. Pots and pans without lids or tops are acceptable. Tupperware and other containers (cookie jars, canisters, etc.) must have lids. They cannot accept items that are broken, chipped, or are missing pieces. TOYS: The VNA will accept all games, stuffed animals, dolls, toys, and puzzles. They cannot accept large plastic toys that are broken, missing pieces or have split parts. Proceeds from your generous donations directly benefit VNA patient services and hospice program. You’ll find a list of items that are unacceptable at the VNA web site. INTERESTED IN VOLUNTEERING? : Join over 250 individuals who volunteer at the VNA Rummage Sale. There is plenty to do, and the Visiting Nurses welcome whatever time you can give whenever you are able. For information, call 908-781-6445.